The year 2010 has come to an end. It is therefore important to evaluate the activities and the work that we have done during this period and the way forward for the year 2011. 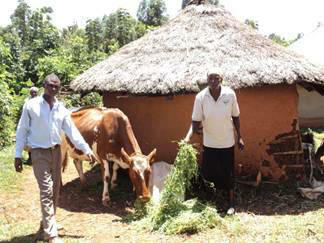 Krispas Henry Ongori and Naomi Henry seen here below with their heifer beside their house. Lawrence Ndege Ontinta and Merciline Ndege. 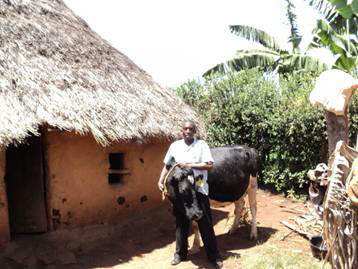 Lawrence is seen in this photo beside his house with their heifer. Wilfred Motondi Nyameri and Jenes Motondi. The Heifer purchased for them has since calved a female heifer which will be passed on to another family after 15 weeks of Weaning. James Guku Guku and Grace Guku. Their heifer too has calved –down to a female heifer which as well will soon be passed on to yet another person who has been identified and asked to make preparations for It. 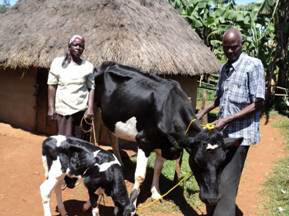 Guku with his wife are seen in the photo here under with their heifer. In the back ground is their family home. Mark Manyoni Nyakwara and Evaline of Magenche. Their Heifer was heavily in-calved and will soon calf-down on or about 18th May 2011. 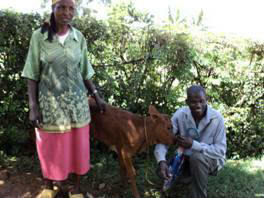 Joyce Nyambuto and Nyambuto Nyatwah whose Heifer is expected to calf - down on or about 12th August 2011. Mrs Nyabuto is seen here below with her two daughters and their Calf. Simon Ibabu Nganga and Nancy Wanjiru Nganga. They received a freishian heifer which was inseminated on 20th July 2010 and there is expected to calf down on or about 20th April 2011. The family of Simon like all the other families expressed joy and appreciation for the gift. 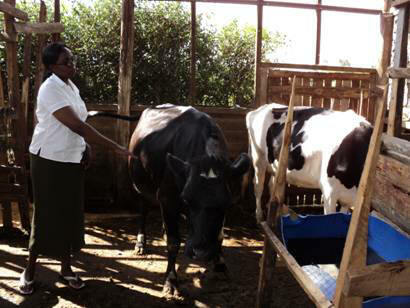 From Nairobi the programme was rolled down to Makutano town where the family of Josiah Noroge Mbugua and his wife received a Friesian dairy cow. The elderly couple is hardworking and have no words to express their joy for having been considered for the project. This family had been greatly affected during the Post election Clashes of Dec 2007. They are happy that they now will be able to get started and have given a lot of praise to God and many thanks to the donors. Since the project started the given-out heifers are doing very well and are in very good health and above all continue to provide milk for the beneficiaries and their families. The heifers which have so far been purchased are all in-calved and already three have calved down as explained above and will soon be passed on to other beneficiaries. This is a wonderful start for the project. Indeed I am happy to say that it has God’s special blessings. The beneficiaries are benefiting from the sale proceeds of the milk which has helped them buy basic necessities like, cooking oil, sugar, soap and textbooks for school going children etc. From these initial heifers the given out heifers have grown to 11 cows and two more members at Ogembo have been asked to start preparing to receive the heifers to be passed on. It is important the participating members receive regular training. In this regard we have had three training sessions. The first one was given by the LifeNets project manager, Musa Nyaira from the training he received on the LifeNets heifer project in Zambia, while the other two were conducted by the Vet- Extension officers from the Kenyan government free of Charge. The participants in the project appreciated the arrangements but have recommended that we give more training which may attract some expenses but for a start so far so good. 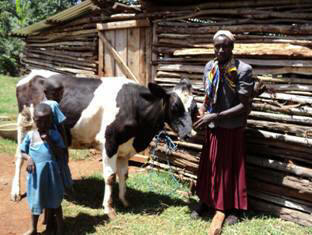 The most recent training session was held for the two members proposed to received the calves to be passed on. Since the project has rolled on to other areas we will look into the possibilities of training each group near their localities to minimize the training expenses. DROUGHT: In this part of the world rainfall is unpredictable and unreliable. For example since December 2010 we have had no rain in most parts of Kenya including areas like Kosele, Got- Kachola, some parts of Nakuru, Madhiany, Bar Ober and Nairobi. During such times animal feeds become a problem for the zero grazing heifers who depend on provided feeds. Indeed, due to the problem of drought we had to delay purchasing a heifer for one lady in Nairobi who instead requested that we wait for the rains so that she can prepare by planting enough napier/elephant grass in anticipation for feeding the heifer her family expects to receive. STORAGE: Dairy products are of necessity required to be kept in places protected from germs while they await for buyers. Therefore in my opinion we may require a cooler to serve the beneficiaries in Ogembo who all live close by. In order for the project to succeed, each participant is supposed to have basic equipment such as a wheelbarrow, cart, grass chaffer and spray pump. A future need may be a truck for transporting hay from distant places during drought seasons in addition to help in supervision and transportation of milk to distant markets. A medium size cooler to help in storage of excess milk during times of plentiful rain to be sold later and also wells for water requirements in some areas. It is my sincere feeling and proposal with your permission that many more individuals could be able to benefit from the programme. We also are considering rolling out the project to more areas like Sotik, Bagaria, Elburgon, Magenche, Kosele and Madhiany and then to Bar-Ober. In areas where dairy cattle cannot do well due to various factors unique to those areas, we could consider giving out upgraded goats for milk or meat. 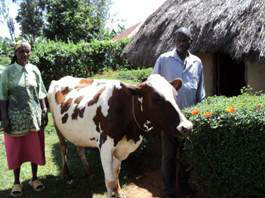 In other areas like Got Kachola, 2 local cows as is done in Zambia. The funds from the initial disbursement received were Kshs 300,000 meant for 5 heifers at a cost of Kshs 60,000 but due to discounts given we were able to buy an extra heifer for one more member, making in all 6 heifers. The second disbursement was for Kshs 306,000 and to-date we have purchased 3 dairy cows for Kshs 205,000 which together with transportation of Kshs 11,500 makes a total of Kshs 216,500. 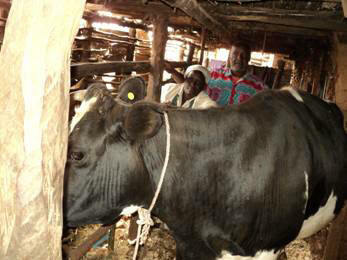 In Nairobi and environs where we have rolled the project; heifers are more expensive than rural areas. We still have a balance Kshs 89,000 which amount is enough to purchase and transport one other heifer after the current drought situation is over. With God’s help and your support we look forward to growing to greater heights for the benefit of the members.